I had heard about the deal last year but didn’t take advantage of it. This year I jumped on the chance to fly anywhere JetBlue flies for $499 for a month. The pass sold out in two days and I didn’t have much time to plan my trip. 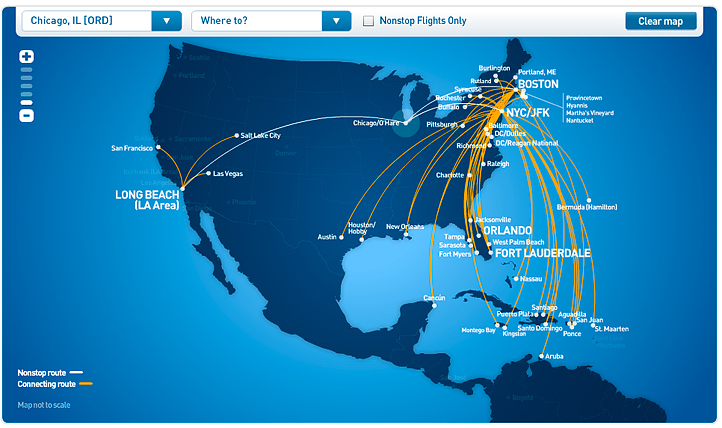 JetBlue only flies direct to three locations from Chicago (Boston, New York and Long Beach) so any way I worked it I would have a lot of connections. Most people don’t realize that JetBlue flies to many international locations—mainly the Caribbean but also Colombia. After I confirmed my ticket I set about scouring the JetBlue website to see how I could get the most out of my pass, including a trip to Bogota. This is the first time I’ve flown JetBlue and after the whirlwind of booking 15 one-way flights I’ve become well-aquanted with the airline’s routes, benefits and limitations. I’m writing this during a layover in Boston on my way to Washington D.C., both cities I’ve never visited. This pass is giving me the opportunity to hop around to a number of cities in the U.S. I’ve been meaning to visit, reconnect with old friends and family and explore two international destinations. At the end of my All You Can Jet experience I will have officially traveled to 50 countries. Only problem is you pay tax on international tickets and that adds up! Otherwise I’d be doing a lot more island hopping.